SPORTING clubs are often a critical factor in building and maintaining a sense of community in small regional towns and the facilities used to house them are often much more than just change rooms for sport, providing a meeting place and social hub as well as community facility used for larger functions. Oval view: Timber screening is extended to the cantilevered covered areas, providing a stronger and united building expression. 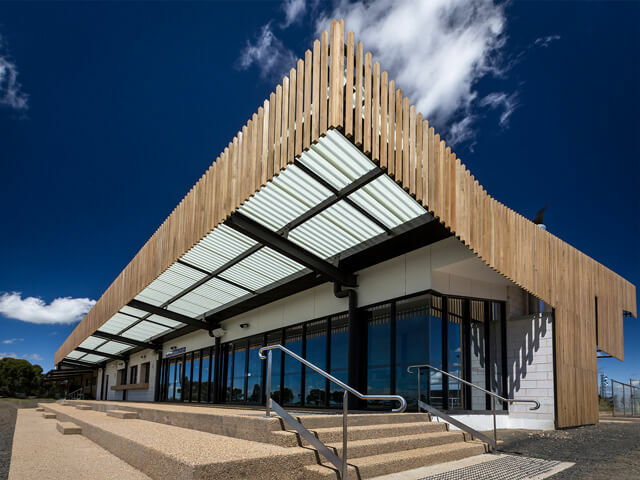 Wellington Council in Victoria’s East Gippsland recognised this pivotal role and set out to rejuvenate the town’s sporting pavilion as part of a wider master plan to upgrade the Gordon Street Recreation Reserve. The pavilion, which hadn’t been upgraded for 30 years, is a central hub for the community of Heyfield and home to the local football, netball, basketball, cricket and even pigeon racing clubs. Wellington Council had expressed a keen desire in its brief for the building to lead by example, incorporating a design that was sustainable and beautiful. 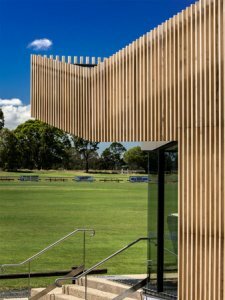 The solution was to use timber in a dynamic and highly visible way on the pavilion’s façade and to incorporate timber into the flooring, joinery and cabinetry as well as bench seating. façade and kitchen bar and server joinery were all sourced from the ASH mill in Heyfield, which is a mill that is certified by Responsible Wood to Australian Standard 4707 relating to chain of custody. The Gordon Street Reserve Pavilion has been short-listed as a finalist in the 19th Australian Timber Design Awards in Sydney on October 16. 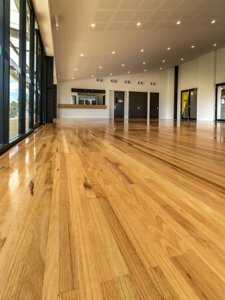 Responsible Wood is the sponsor of the Australian Certified Timber category. A strong timber flavour internally: locally sourced Vic Ash flooring features internally and serves a multitude of uses. Cantilevered canopy detail: The cantilevered canopy lifts towards the oval to take in the sporting spectacle and views of the oval.